The love month officially opened with Eat Bulaga! and Marimar once again dominating their respective timeslots. Robin Padilla and Regine Velasquez jump-started February by providing the perfect mood for Valentine's Day. For February 1, Friday, the noontime show of Tito, Vic & Joey, Eat Bulaga!, garnered a 25.6 percent rating to beat Daisy Siete's 22.9 percent rating. Notching the third spot was My Only Love, which collected a 16.2 percent rating, edging out another GMA-7 program, Come Back Soon-Ae (16 percent). Two GMA-7 programs, Takeshi's Castle and Maging Akin Ka Lamang, for their part, were locked for the fifth spot, with both programs carrying an identical 15.8 percent rating. Kris Aquino's three-week-old Wheel of Fortune continues to fare well, this time securing the No. 8 position, on the strength of its 13.8 percent rating. Following closely was Edu Manzano's Pilipinas, Game KNB? with 13.5 percent. Completing the daytime race was SiS with 11.6 percent. Despite facing serious competition, Marimar, Kamandag, Coffee Prince, Zaido, and 24 Oras still maintained their tight grip on the top five positions. Leading the pack is still the duo of Marian Rivera and Dingdong Dantes, collecting 43.1 percent for Marimar. Kamandag, starring Richard Gutierrez (who recently celebrated his 24th birthday and 7th year anniversary in showbiz), remained at close second with 37.1 percent. ABS-CBN's Kung Fu Kids emerged as the top performer among the three new programs under the Kapamilya Network. Trailing behind 24 Oras, Kung Fu Kids nailed the sixth spot with 25.7 percent rating. Not to be left behind, Angel Locsin and Piolo Pascual's Lobo was in hot pursuit with 25.4 percent. TV Patrol World snared the No. 8 slot. The slot was expected to go to Palos, which had been promoted as part of the formidable ABS-CBN primetime trio which includes Kung Fu Kids and Lobo. TV Patrol World got 20.9 percent; Palos got 19.4 percent. After weeks of pale performances, StarTalk again asserted its dominance, this time snatching the third spot via its 16.5 percent rating. Its rival, Entertainment Live, was lodgedin the bottom of the race with a rating of 8.9 percent, which was good for the ninth spot. With both shows not giving an inch, Takeshi's Castle and Volta shared the fifth spot, carrying identical 15.5 percent ratings. Robin Padilla and Regine Velasquez's romantic film, Till I Met You, conquered Sunday's program ratings. Riding on the crest of its 18.8 percent rating, Till I Met You topped SOP's 17.5 percent showing. 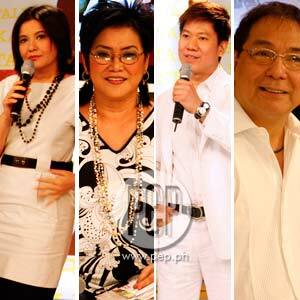 Showbiz Central's 16.4 percent rating, on the other hand, edged out The Buzz's 9.9 percent rating. This, despite the strong lineup presented by the trio of Boy Abunda, Cristy Fermin and Ruffa Gutierrez, particularly their phone interview with former actress-singer Jessa Zaragosa. Jessa lashed out at comedienne Rufa Mae Quinto for allegedly spreading lies about her and her husband Dingdong Avanzado in Rufa Mae's tell-all interview in the February issue of YES! magazine. Mel & Joey remained unfazed at the top spot, beating out Kap's Amazing Stories (26.7 percent) and Tok! Tok! Tok! (25.7 percent). Carrying a slim lead, Mel Tiangco and Joey de Leon garnered a 27.5 percent rating, consequently propelling them to the No. 1 slot.